Children’s sense of safety and belonging at school has been shown to foster school success in many ways. When children’s needs in the school environment are met, they are more likely to feel attached to their school. In turn, children who feel more attached to their school have better attendance and higher academic performance. These children are also less likely to engage in high-risk behaviours. Children thriving in this dimension view school as a safe, positive space that satisfies their growing need for autonomy by seeking their input and including their voice in school and classroom decision making. Thriving children feel like they have a valued place and role in the school–that they belong–and that the school is free from harassment and bullying. School climate is the overall tone of the school environment, including the way teachers and students interact and how students treat each other. Children’s comfort in their learning environment affects their motivation, enjoyment of school and ability to pay attention in class. Positive interactions between teachers and students result in students feeling greater happiness, contentment and calmness. Students benefiting from a positive school climate even report an increased commitment to learning and show improved reading comprehension. A child develops beliefs about their own academic ability, including their perception of themselves as a student. This is their academic self-concept and influences how interested and confident they feel at school. The MDI asks them to consider their ability to learn new things, do a good job on school work, and whether they feel that even if the work is hard, they can learn it. 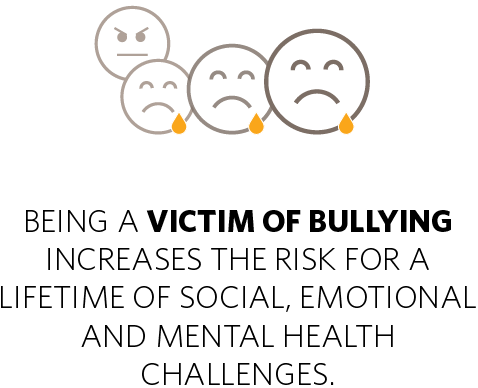 Victimization and bullying can increase the risk for a lifetime of social, emotional and mental health challenges. Bullying is a distinct form of aggressive behaviour in which one child or a group of children act intentionally and repeatedly to cause harm or embarrassment to another child or group of children who have less power. Negative thoughts continue long after bullying stops. Cyber (being threatened or embarrassed via computer/text message), Physical (being physically hurt or threatened, or having possessions taken or damaged), Social (feeling intentionally excluded, or being the victim of gossip or rumours), and Verbal (being called names, teased, or feeling coerced).